This is nothing advertising but ,just in case, if you wanna find a nice place to do waxing/pedicure/medicure, Pink Parlour can be one of your options! I used to do my Brazilian Waxing at Strip Ministry of Waxing, located at ION (they many other outlets too) then i changed to Pink Parlour because of the bad service at Strip. Maybe i can elaborate a bit more because this is a real encounter by me. I booked an appointment with Strip to do my brazilian waxing on the phone. It was an appointment at 4.30 pm @ION. Short and Sweet: I WAS 10 MINUTES LATE. I know its my fault for being late and i really shouldn't done that but i had a hard time finding its location in ION. "Hi, This is Strip calling. Kacey is it? Where are you now?" "Hello! Ya i'm on my way here." "Ok. But you are 10 minutes late and your appointment is at 4.30 pm. Its 4.40pm now already. Are you reaching soon?" "Ya sorry i had a hard time finding my way. I'm reaching already." "Ok. But please don't be late the next time okay?" *The above conversation is not the 100% exact words spoken. Who can bloody remember every single words in a conversation which had happened many months ago? But! The content is right. A question: How do you feel when you, as a customer, hear this? My answer: I was feeling terrible! I am the one paying for the service and it isn't cheap at all. One session of brazilian waxing costs about $55. And i have to hear your complains and i am the customer. Don't Singapore always say that Customers Are Always Right? I mean you can politely ask me where i am and if i am able to make it on time, POLITELY. She sounded like damn pissed off with me. Anyway, the first encounter wasn't so bad because though i was late, i still got it done. Oh, when i reached the shop, i could sense the 'pissed off' atmosphere... There was a guy in the shop too and he was so much better than that lady. Again, i went to do my monthly brazilian waxing. I was quite reluctant to do it at Strip then because i know i am not those type who can make it on time. Besides for that month, i had something going on before the appointment so i told the staff that i will come in-between 6.30-6.45pm. Guess what? The lady ( i think its the same person) called me at 6.35pm and said I WAS ALREADY LATE. "Hello Kacey you are already late for the appointment. Its 6.35pm now." BLOODY HELL. i had enough of this but i still apologized and reminded the staff that i told this guy about coming in latest by 6.45pm. NOT BLOODY 6.35PM or whatsoever. So we hung up the phone and i continued heading to ION. Anyway, i was still late by 5-10 minutes in the end. Guess what happened then? I CANNOT DO MY WAXING ANYMORE! BECAUSE ALL THE SPACE/SLOTS ARE BEING TAKEN! If its their policy to replace the customer who is late with another customer, then by all means i can quit visiting them again. The angry part is not about getting to do my waxing at the end of the day. It is the tone and words used in this conversation. They should stop telling customers that they are late for how many minutes and just be nice and friendly! That is the most effortless way to maintain a good relationship with a customer and gain repeat visits. Don't they bloody know these simple rules? So i couldn't get my brazilian waxing done at Strip, (Oh i did try to ask for other outlets but all were full.) i went to google another shop that has brazilian waxing at town. Then i remembered that i read about Pink Parlour. So i googled "Pink Parlour" and checked. DANG!!! They have an outlet at Orchard Central! Immediately, i called them and asked if they were available then. They said sure and i quickly head over. WHEN I REACHED PINK PARLOUR, I WAS GREETED WARMLY BY THE STAFF. yay! Ok maybe that's a bit exaggerated but they weren't as 'pissed off' as the staff at STRIP. The place was beautiful. Its all covered in pink and black. The most amazing thing was this: They served me nice jasmine tea while i was waiting! There are magazines to read too. STRIP NEVER DOES THAT TO ME. So i happily went in to do my brazilian waxing and the staff was so friendly she chatted with me all the way till it ends. Mainly the reason why so is because talking can distract me from feeling pain when my hair is removed. It's kinda painful you know??! lol. SO EVERYTHING WAS DONE AND I WAS A HAPPY GIRL. The thing is to spend the money happily and not reluctantly. From then on i went Pink Parlour every time! 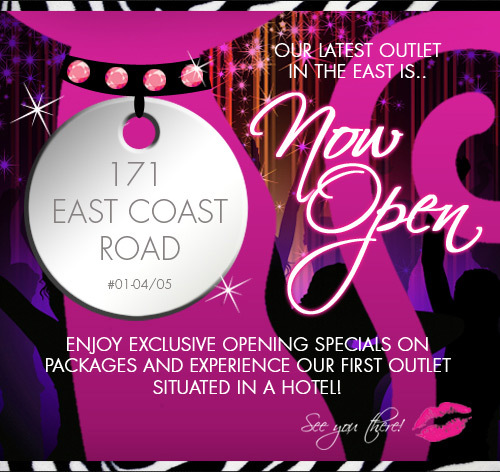 Okay so here it is, Pink Parlour has opened a new branch at East Coast. Cool! Have a fun time waxing!!! I'm surprised about STRIP but after reading your article, I realized that many others have similar experience according to http://www.beautyundercover.sg/face-and-body/strip-ministry-of-waxing/!